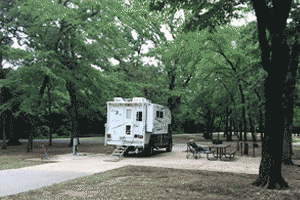 West Burns Run Campgrounds is a Corps of Engineers operated facility located in the Oklahoma Cross Timbers Region on the southeastern shores of Lake Texoma. West Burns Run is located off Highway 91, less than four miles east of Cartwright, Oklahoma, and approximately 11 miles northeast of Denison, Texas. West Burns Run Campgrounds offer beautiful views which overlook the main portion of the lake. Campsites are nestled among Post oaks and blackjack oaks which forest the rolling hills of the region. The campground features 117 campsites, 105 with electric and water hookups and 12 primitive tent sites. The campground also features five group campsites, picnic areas, 2 day-use group picnic shelters with electric and water, flush and vault toilets, three dump stations, showers and drinking water. Other amenities include a swimming area, beach, boat ramp and playground. Entrance gates are open from 6 am to 10 pm. October 1, 2016 through March 31, 2017: Park will be closed. The nearest Corps of Engineers campground open for off-season camping and boat launching is Burns Run East or Platter Flats.